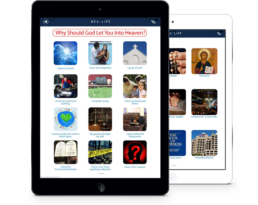 Free app for iPad and Android tablet. Download now at the Apple App Store for iPad or at jamesgmccarthy.com for Android devices. Great conversation starter for the presentation of the gospel. Designed to instruct people who are Christian or who have a Christian background but who are unclear about salvation. Can be used in the home, Christian schools, churches, summer camps, vacation Bible schools, college campuses, and at special events.Age-specific modules tailor the instruction for children, aged seven and older. Denomination-specific modules tailor the instruction for adults. If you have an iPad or Android tablet, please bring it to Lafayette. We’ll be training you in the use of this new evangelistic tool.